Next, Tipton asked the fit 36-year-old, who, it must be acknowledged, smelled of alcohol, to count backward, starting at 46 and ending at 25. Benjamin complied, hitting all the numbers sequentially, beginning and ending where he was told. Not bad, but there was still a problem. “Just based on the eyes, I would arrest him,” Tipton said. “The eyes” refers to an earlier maneuver Tipton had Benjamin perform. It entailed following Tipton’s finger side-to-side and up-and-down without moving his head. When the eyes jump, dart or bounce – rather than following the target smoothly – that is a sign that the subject has been drinking. In fact, it’s the most accurate gauge of intoxication of all the roadside maneuvers, Tipton said. “Eyes never lie,” he said. Fortunately for Benjamin, he was not on the side of the road. Rather, he was at the Three Springs police substation participating in a nonscientific experiment into alcohol’s effects on the skills necessary for driving. The legal threshold for driving under the influence is 0.08 percent blood-alcohol content. A level above 0.05 but below 0.08 percent is considered driving while ability impaired, a lesser, but still serious charge. Tipton said only Wyoming and Colorado have a criminal charge for less than 0.08 percent. While these numbers may be clear and simple, determining how much alcohol it takes a person to reach them – and how impaired they may become along the way – is not. A raft of variables can come into play, including the type of alcohol, whether the drinker ate, how large he or she is, how quickly the alcohol was consumed and so on. In this gray area, drinkers are left to judge for themselves. The problem with that, Tipton said, is, the first thing to become impaired from alcohol is judgment. The result is drinkers make notoriously bad decisions about whether they are too drunk to drive. Only this could explain the hundreds – 350 to 500 a year – of DUI arrests made in Durango alone. The ones who aren’t caught – or aren’t caught in time – sometimes kill themselves or others. To document alcohol’s effects on people of varied sizes, volunteers were sought from the Herald newsroom. Five participants – three men and two women – gamely obliged. None, for the record, drove home after the experiment. To control some of the variables, the subjects were all asked to eat a light lunch (the experiment began at 2:20 p.m.). The two women both consumed white wine (a 2012 sauvignon blanc) and the men drank beer (an import and two different local microbrews). The alcohol was obtained by the Herald. A similar demonstration of intoxication, Tipton said, is included in police officers’ DUI training. He said it is hard to find volunteer subjects because that demo starts in the morning – earlier than most people care to drink. When the newsroom staff settled in to the substation’s training room to start the experiment, they, too, were a bit inhibited. 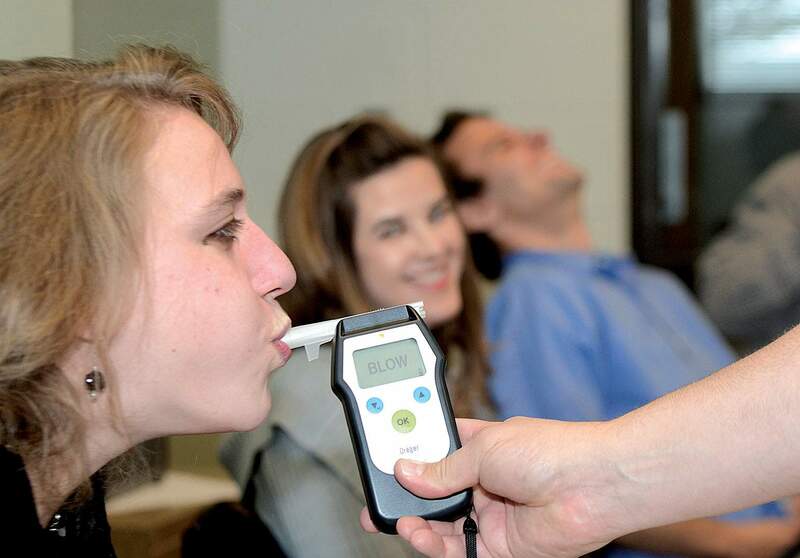 At around 2:45 p.m., the first breath tests were administered. 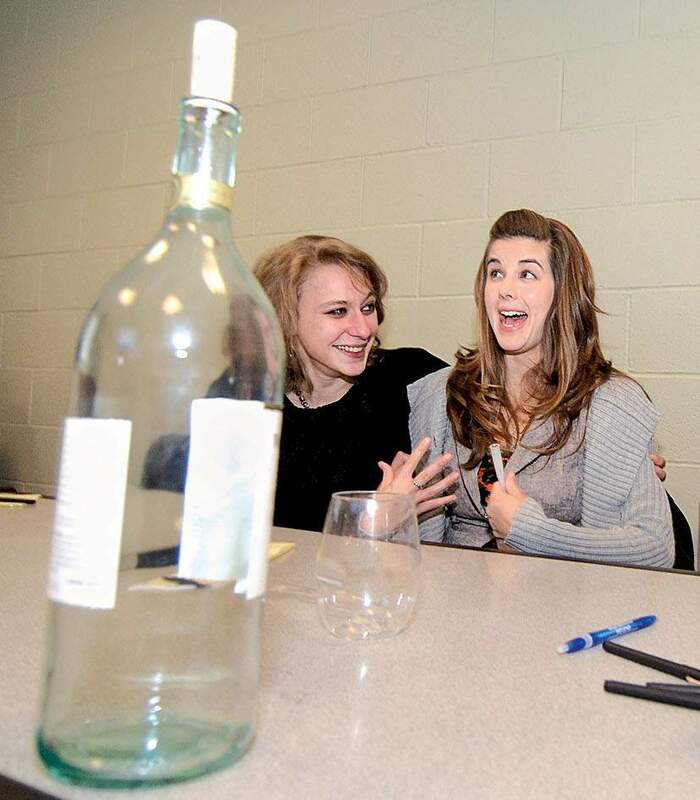 The women, Olivarius-McAllister and editorial assistant Sarah Silvernail, had finished two glasses of wine. (No measuring container was available so the fill-level was marked on the glasses; the volume was later determine to be 8 ounces – 3 ounces more than the 5 ounces generally considered to be a standard glass of wine). After 16 ounces of wine in about 20 to 25 minutes, the two women already had surpassed the 0.08 percent legal limit for DUI. Silvernail, who is 5 feet 6 inches tall and svelte, was at 0.117 percent blood alcohol content. “I am such a lightweight,” she said upon learning the number. She said she might not have pegged herself as too drunk to drive. Olivarius-McAllister, who is just taller than 5-feet, 8-inches inches and weighs about 165 pounds, had a BAC of 0.065 percent, placing her within the driving-while-ability-impaired range, but less than the DUI threshold. In notes on the experiment, she wrote that she felt “animated” at that point. Tipton said impaired drivers in the 0.05 to 0.079 percent range can actually be more dangerous than more intoxicated drivers because they are overconfident. “These people here (signaling the range on a whiteboard) take more chances than anyone,” he said. The men, meanwhile, registered much lower levels. Arts & Entertainment Editor Ted Holteen had a blood-alcohol content of just 0.015 percent after two beers in 20 minutes. Benjamin and Photo Editor Jerry McBride were slightly ahead at 0.041 percent and 0.039 percent, respectively. After five beers (a combination of Dos Equis Amber and two microbrews) in 1 hours and 40 minutes, none of the three had reached the DUI limit. Benjamin was the highest at 0.064 percent. It wasn’t until after seven beers in 3 hours and 20 minutes that McBride and Benjamin crossed the DUI limit (0.094 and 0.106 percent respectively). After nine beers in the same amount of time, Holteen, who has size and high tolerance on his side, registered 0.102 percent. At around 5 p.m., Tipton ran Holteen through the gamut of field sobriety maneuvers. The last one entailed putting one hand and then the other on the back of his head and interlacing his fingers. He then was told to spread his legs. All present laughed heartily when it became apparently he was being made to assume the arrest position. District Attorney Todd Risberg, who was not present at the experiment, said he has seen DUI penalties increase in severity through the years. The same attitude shift has occurred with drunken driving. “There’s very little sympathy for people who are arrested for DUI,” he said. Chase Olivarius-McAllister, a reporter with The Durango Herald, undergoes a preliminary breath test at the Durango Police Department substation at Three Springs. Drinkers often have difficulty judging how intoxicated they are. Chase Olivarius-McAllister, left, and Sarah Silvernail take part in a blood alcohol content demonstration recently at the Durango Police Department substation at Three Springs. Silvernail, the smallest participant, became intoxicated much more rapidly. 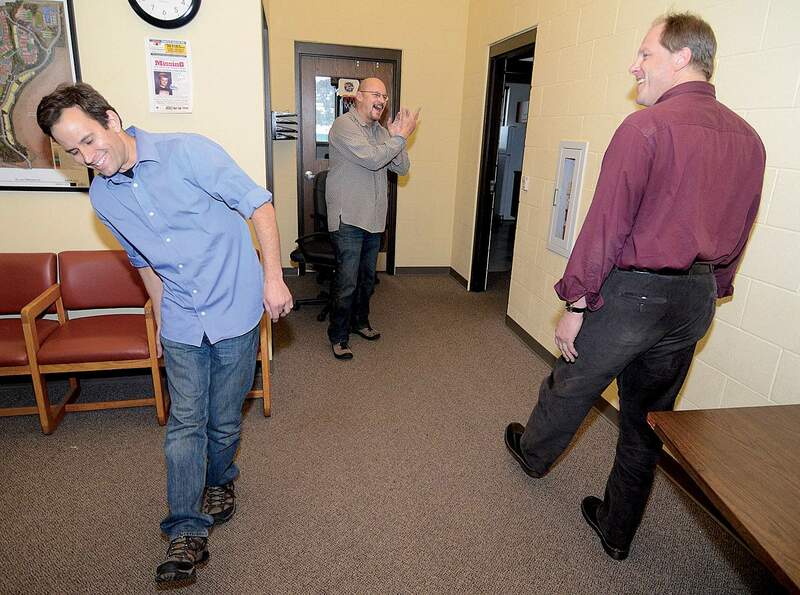 Shane Benjamin, left, attempts to walk a straight line while Jerry McBride, center, and Ted Holteen deal with their own intensified inebriation. Officers look at not only how well subjects perform maneuvers but also how well they follow directions. 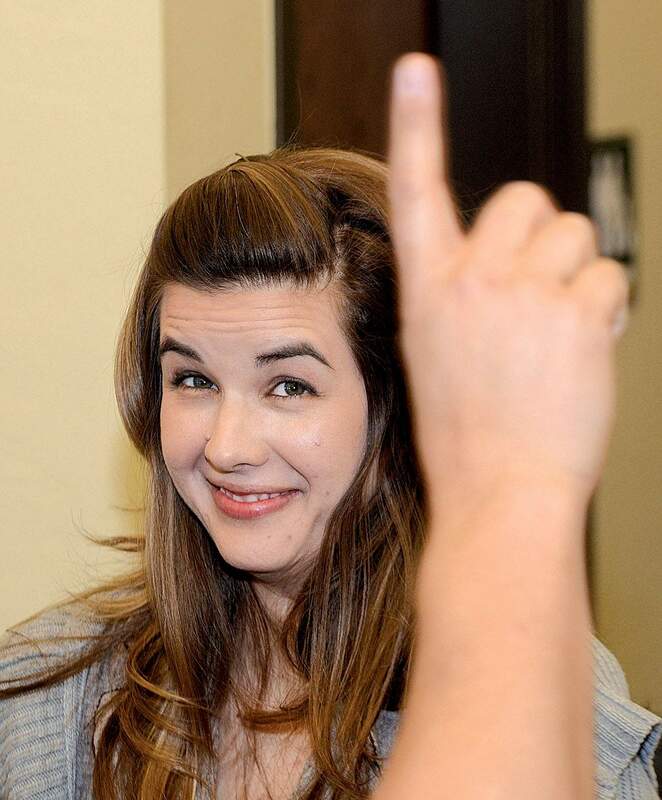 Sarah Silvernail undergoes a field sobriety maneuver that entails following the officers finger.